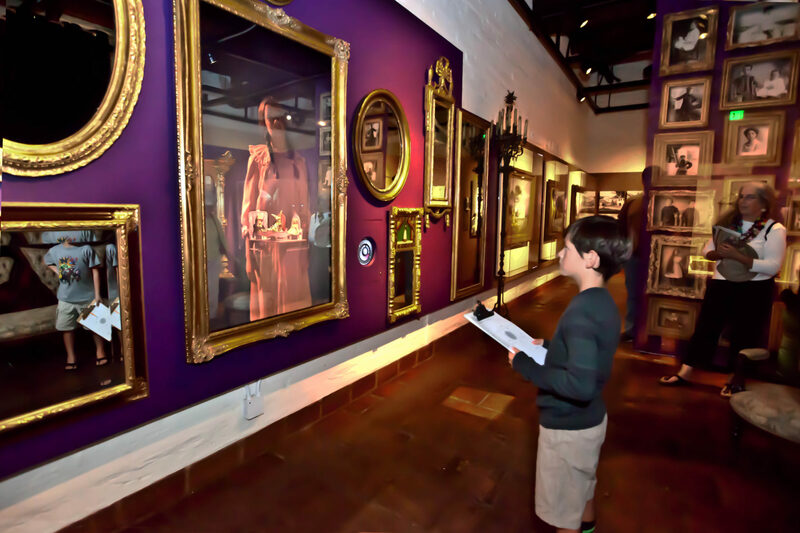 The Museum is proud to introduce a new interactive exhibit for all ages, The Haunted Mirror. A wall of vintage mirrors beckons visitors to the past with a “doorbell,” through which the observers can experience a visit from a “ghost.” The historical characters summoned by the doorbell tell stories about their life and encourage the observers to hunt for evidence of their existence in the Museum’s main exhibition. You’ll meet Anna, a 13-year-old girl and Peter, a ten-year-old boy from the late nineteenth century who will discuss early transportation in mule carts and the first hotels and their importance in the development of the economy of Santa Barbara. Kids can search for clues and answers to a fun treasure hunt after they stop at the front desk. Content for the exhibition using local actors was researched, created and produced by Museum staff along with TVSB, and JCRR Design. Funding for the project was generous given by the Alice Tweed Tuohy Foundation.